This booklet was initially published by Piccadilly Precision Engineering Ltd specifically intended for their line of Adjustable Thread Caliper Gages. The original has been preserved in PDF format for your download. They also have a booklet for Roller Style Thread Caliper Gages available. 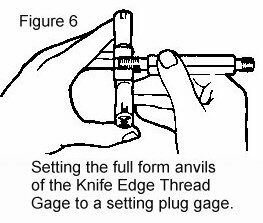 This booklet has been written to assist users who are desirous of setting and maintaining their own gages. It will also enable the user to obtain the maximum benefit from the system and the greatest economy in the use of the gages themselves. If the instructions given are faithfully carried out, the gages will give long life with accurate performance and trouble-free assembly of the product. Most of the maintenance necessary is required to restore chipped or worn GO (front) anvils. The causes of this condition may be various but are generally found to be due to the incorrect application of the gage to the work. The work should be passed from the front to the back of the anvils. Care should be taken to set the dies so that the work passes as easily as possible through the GO anvils, without passing through the NOGO (back) anvils. Do not make the work a fit in the GO anvils. This not only causes excessive wear on the anvils and takes a long time to inspect, but also eliminates the advantages of the tolerances available on the product. Do not force the work through the GO anvils, AND ABOVE ALL DO NOT PULL THE WORK THROUGH FROM THE BACK as shown in Figure 1. To remove the anvils, first remove the lead seals at the end of the anvil holes with a small screwdriver or similar tool. Slacken locking screw (Figure 2, A) with the special adjusting key which is available as an extra accessory (Figure 3). Insert the two pegs of the key, through the two holes in the locking screw (Figure 2, A) into the slot in the adjusting screw (Figure 2, B) and remove both locking and adjusting screws together. Then remove spherical locking cone (Figure 2, C). 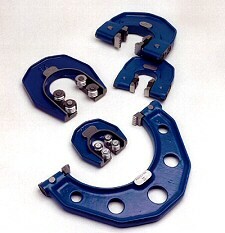 The anvils on gages larger than � inch can then be removed. 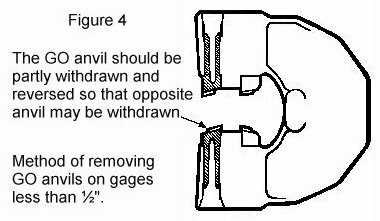 To remove the anvils on gages � inch or smaller, follow the steps above and then push the GO and NOGO anvils on one side of the gage back against the frame to the extreme position. One of the GO anvils should be reversed from its normal position (Figure 4) before pushing back. The opposite GO and NOGO anvils can now be removed by tapping the shank with a 5/16 inch diameter brass rod. This will reduce the danger of chipping the threads on either anvil. If the gages become worn or damaged they can be repaired. Because the wear is concentrated at the tip of the anvils, they can be returned to proper functioning condition by grinding back the front edge of the anvils. 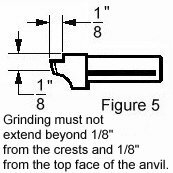 The maximum grinding must not extend beyond 1/8 inch from the crests and 1/8 inch from the top face of the anvil (Figure 5). The anvils should then be reassembled in the frame by reversing the disassembly procedure. Great care needs to be taken to avoid damage to the anvils. 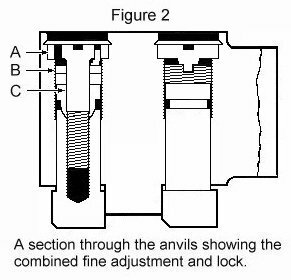 The locating abutments on the frame are hardened and must not be allowed to foul the crests of the thread profile on the anvils. The anvils marked with a letter F or an ha figure should face the same way as the marking on the gage frame giving the size of the gage. Reset to setting plugs as shown in Figures 6, 7 and 8. NOTE: Setting plugs are ABSOLUTELY NECESSARY when customers undertake the grinding operation. These are the same set plug gages that would be used to set adjustable style thread ring gages. Set the GO anvils using the GO set plug. 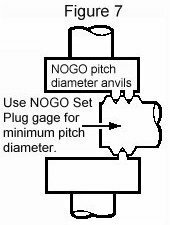 Set the NOGO anvils using the NOGO set plug. When resetting the anvils it is recommended that the initial setting be to a core figure of 0.005 inch less than that finally desired. It will then be normally possible to make the final adjustments by tension on the locking screw (Figure 2, A). We recommend a setting slightly closer than final and a light tap with a hide hammer on the faces of the front anvils to relax and disperse any strains on the same. 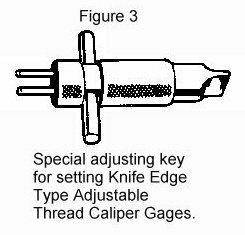 After setting and final locking, the gages may be sealed with lead seals. Users trade marks or initials can be stamped on the seals by means of a special punch and is a safeguard against the operator disturbing the setting of the gage. Seals can be supplied as an extra accessory. It is a useful precaution to recheck the minor diameter of the GO and NOGO gaps after resetting and for this purpose the use of Gage Blocks is recommended. When using these however, great care must be taken not to damage the crests of the thread of the anvils, particularly those of the GO gap. If it is found necessary to supply new anvils. 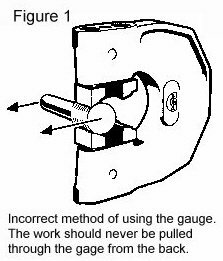 The complete gage should be returned to the gage maker.